One of the three priorities in Our Plan 2020 is to Foster student learning and wellbeing. 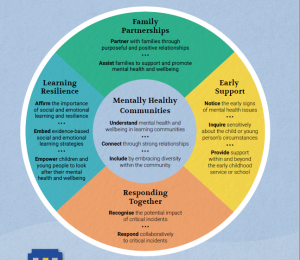 A key strategy in this priority area was to identify and implement a wellbeing/mental health framework and incorporate creative means that advocate the importance of wellbeing to the whole school community. The school is using the Be You Framework. Be You is a national initiative for educators, aimed at promoting and protecting positive mental health in children and young people. The vision is for an education system in which every learning community is positive, inclusive and resilient, and where every child, young person, staff member, and family can achieve their best possible mental health. To learn more about the background to Be You, visit beyou.edu.au/.